Rivers State Governor, Nyesom Wike says his administration plans to upgrade Ken Saro-Wiwa Polytechnic to a University of Environment. Nyesom made the pledge when he hosted a team of Khana-Gokana-Tai-Eleme (KALGOTE) group, who paid him a courtesy visit on Wednesday in Port Harcourt. KALGOTE is a socio-cultural organisation, working for the development of Ogoni communities, spread across four local government areas of the state. The governor said that his administration would set up a committee to study the viability of upgrading the state-owned polytechnic into a university, in view of the current economic realities. According to him, the State Executive Council will discuss the upgrading issue at its next meeting. He also told the group that the state government would construct a general hospital in Tai Local Government Area, in order to make healthcare delivery accessible to the people. 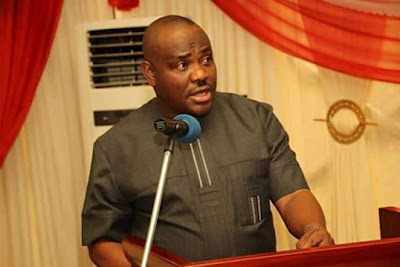 “In the next few weeks, we shall be in Tai Local Government Area,to begin a major project for the people,’’ Wike said. He noted that every part of the state was entitled to projects and that the state government would continue to invest in the development of the state. Wike also said that his administration would resolve the boundary conflict between the Ogonis and the people of Ogu-Bolo. The governor also used the occasion to direct the Secretary to the Rivers State Government to arrange for the return of 800 Ogoni people stranded in Benin Republic back to the state. Earlier, the President of the group, Mr Peter Nedee, commended Wike for his outstanding development strides in Ogoni land. Nedee said the group came to thank the governor for key appointments given to Ogoni sons and daughters in his administration. He urged the governor to further assist the Ogoni communities to prevail on the Federal Government against establishing a prison in the area. Nedee stressed that Ogoni people preferred development projects that would improve the lives of the people.